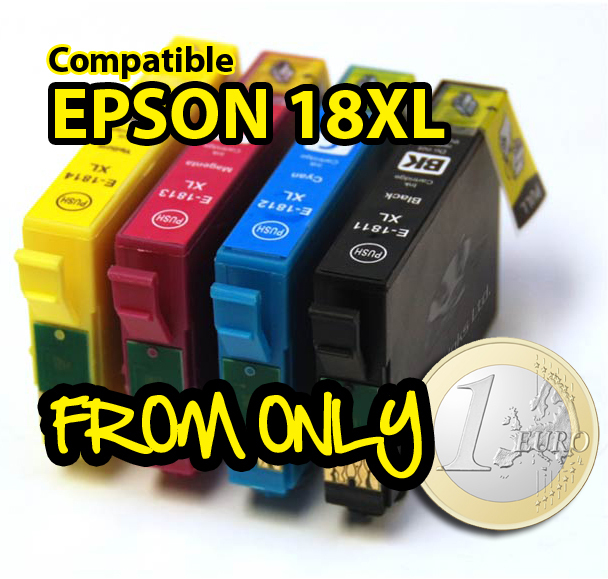 The popular Epson 18XL Multipack consists of 4 ink cartridges, T1811 black, T1812 cyan, T1813 magenta and T1814 yellow. The original brand Epson black ink cartridge has an ink volume of 11.5ml whereas the compatible version is filled to capacity and has an ink volume of 16ml! that’s 5ml more ink for starters with the compatible. The original brand colour ink cartridges each have an ink volume of just 6.6ml while the compatible version are almost double that at 11ml! There is simply no comparison when it comes to value for money with the compatible version of the Epson 18XL ink cartridge. Lets have a look at the pros and cons of using non-original Epson ink cartridges. The pros by far outweigh the cons as the print quality is fine for everyday general purpose printing at home and in the office. Compatible Epson 18Xl can give print results that are virtually undistinguishable from the original Epson cartridges with vibrant colours and good contrast. The price alone is reason enough for people to make the switch from original brand to compatible and if the results are satisfactory then there is no reason why you shouldn’t make the leap of faith. Compatible ink cartridges can sometimes attract some negative press especially in the past when there were some very dodgy compatible in circulation from China with poor quality and similar reliability. Any good online supplier will stand over their products and with all good quality third party compatibles now being manufactured to the same ISO standards as the originals then there is already a reduction in the amount of cartridge failures and bad press they receive. The popular Epson 18XL is available in a best buy 20 pack the busy home or small office user or the smaller 12, 8 and 4 pack for the more occasional user.